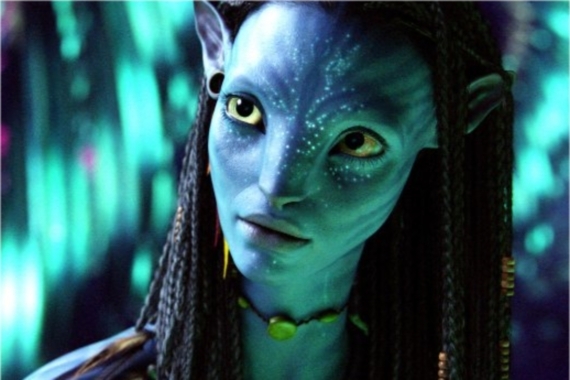 Kvond has a beautifully written post on James Cameron’s latest, Avatar: The Density of Being (you can tell he’s been reading Brian Massumi), to which I can only add my own quick thoughts after seeing the film this weekend. 1) New York Times op-ed columnist Ross Douthat has it partly right: with its tree/Goddess-worshipping, tribal-shamanic-indigenous-hunter-gatherer-Daoist-pagan New-Age all-is-One-ism, Avatar is an expression of the longstanding American tradition of pantheist nature spirituality. Douthat thinks that that’s mainstream and that Hollywood is fully behind it, but it’s really still the insurgent religion to muscular Christianity and militarist nationalism. This is one of the rare films in which the Goddess (Mother Nature & the Natives) takes on the Capitalist War Machine and… well, you’ll have to see who wins. 3) The Na’vi and their planet, Pandora (Pan-Thea, the tree-forest-rhizome-neural-network Goddess and World Soul, Pandora whose box, when opened, unleashed a million megatons of reality on humanity — it’s pagan mythology with a sledgehammer; gotta love it): They are beautiful — as all the reviews say, there are scenes that are among the most beautiful ever put to screen. Cutting-edge CGI in the service of animating and re-enchanting nature, the movie is a cine-kinetic fusion of Bambi, Terminator, and Crouching Tiger, Hidden Dragon (and much else; see kvond). There are strong resonances with Ursula LeGuin’s novella “The Word for World is Forest” (a Vietnam war-like attack on a beautiful planet and its indigenous inhabitants) and her utopian ethnographic-poetic-musical epic novel Always Coming Home, its future-primitive Pacific Coastal ‘Kesh’ people being a kind of west coast precursor to the Na’vi. The ethnographic theme — the translation/mediation between two opposed cultural worlds, science and anthropology’s dependence and ultimate answerability only to empire/colonialism/militarism, and the cultural intermediary’s desire to go native, is overly stereotypical but, for the Hollywood thriller format, not badly done. It will propagate the gone-to-Croatan meme for a new generation. Yes, it’s entertainment, and ideology, and religion, and politics… Happy Solstice to all. A couple of connections that I made after having written my review. This bears significant correspondence to the revelation that the entire Pandorean world (or its life forms) are a huge synaptic entity. Secondly, a lot of the AVATAR exotic otherworldliness, facilitated by the remarkable 3D, reminded me in a bodily sense of scuba experiences, back in the day when I was an avid diver. As it turns out, Cameron devoted much of his life to diving after his success in Titanic, and no doubt was after the kinds of transport that diving gives you. Perhaps there is no other ecological encounter which is so alien to our physiology, and so decentering. When one dives there is a kind of avatarship experience of suspension. One wonders if indeed it is just this kind of transportation which is required for the ecological. Yes, the film is ideologically ecological, but even more, it may be metaphysically so (noting the difference). p.s. It is interesting that you have read my review in terms of Massumi (which I have just started). I actually find myself at loggerheads with Massumi to a frustrating degree in the early-going. Kevin – Thanks for the Pando reference – that’s very interesting. Sean Cubitt’s analysis of media in his “Ecomedia” does try to get at this idea of what might be “metaphysically ecological.” His terms of reference are biosemiotic/ecosemiotic (which I know you have some familiarity with). “The Blue Planet”, which I’ve assigned to my students in relation to the “Ocean Deep” segment of the Planet Earth series (with productive results). Yes, the Antartic footage was powerful and synthetic. It brought me much closer to what I was thinking about in absolute cold (I think I commented, but I can’t be sure). There is something distinctly “out of body” about scuba, and technological, but also in-environmental, that reveals “spectacle” to be not just something watched. It is dis-locating in a significant way. I don’t know Sean Cubitt at all, I should look him up. It sounds promising, but as you might recall, I also resist the phenomenological reductions that often inhabit ecological semoitics…the notion that our experiences somehow categorically “bubble” us off from other things. Am I missing some parts of the discussion between you two? Or is it simply that you prefer Cubitt’s take to Brereton’s? I’m not quite sure how one measures how much an art form has lead to change. Did the Cistine Chapel ceiling or the Pieta lead to social, structural change? How in the world would that be measured? My work is more indebted to a cultural-studies approach that considers film over the cycle of its production and reception, and queries its eco-socio-political effects not as some direct outcome of a film viewing but as a kind of distribution of effects, percepts, affects, etc., through its cultural uptake by audiences. Different viewers take different things from a film, and it’s quite possible that Avatar or a Spielberg film could bring about a change of consciousness for a viewer (on some level, perhaps to be triggered later, say, when visiting a rainforest for the first time or something like that). But I’m not convinced that eco-sublime imagery so clearly has a positive eco-psychological impact (as Pat tends to suggest in his book). The cultural uses of such imagery have been many & variable. More generally, it’s very difficult to “measure” how an art form contributes to change; but it’s still valuable to try, through thick contextual analysis, to figure out how certain kinds of art are used by people and contribute to processes of social change. For me, this means studying social movements, discussions about films among specific audiences (interpretive communities), etc. — one’s own personal interpretation of a film is never enough. Thanks for the question — it’s a good one. Thanks Adrian, good to know and follow your position as per Brereton. I suppose for me I am always looking for the potential in artforms, and its best not to read them under the auspices of whether they are “good for the cause” or not. Such dynamics reverse themselves all the time. Sometimes I feel that being able to critically align oneself against an artform is more about positioning oneself within an ideological position, and leveraging a kind of discursive power that confirms your commitment (I’m not saying this of you, but of social criticism others). I can see how you would find Brereton’s reading over simplified, but I am wondering how you read Avatar (aside from the paradoxical positions you find within it). Is this a “good film” for the cause in your reading? kvond: Is this a “good film” for the cause in your reading? ai: Your question assumes a direct relationship between a film and its effects. Whether it ends up being “good for the cause” depends completely on what it does. (That’s a Spinozan/Deleuzian take on it, isn’t it?) To take one example, Avatar seems to be raising the ire of the social & religious right, which hates its pantheism, New Age mysticism, “Gaianism”, etc. While public discussion about the film could easily remain at, or sink into, the level of stupid polemics, it could also generate a fruitful discussion about pantheism, religion, nature, American identity, Hollywood, politics, etc. – which is why I (and I’m guessing you too) blog about it. … But in what it makes available (perceptually, affectively, cognitively) for such cultural uptake, I’d say it’s pretty good. I found your analysis of the plot to be very enlightening. Cameron has encorporated anti-capitalism messsages in previous movies (such as aliens where the corporation wants to capture the alien for a bio weapons program). I enjoyed this post! I watched this movie.It was an excellent movie.Nice article. This film is almost beyond description. I saw it in 3D and now MUST see it again in IMAX 3D. There’s a reason this will be the top grossing all time film. See it! GREAT! There is truly something here for everybody. ive seen the movie, its a great written script. its new and refreshing and there is nothing else like it. thanks for the resources, il be checking them out soon. Avator is really a good entertaining Film. I feel its next level for Animation Industry but such hype around it is too much. generally I just|only visit blogs and retrieve my required information but this time the useful information that you posted in this post compelled me to reply here and appreciate your good work. Pretty very interesting information on a single page.I would like to say America was founded as a land of drop-outs.So almost at once it began to produce its own dissidents white and black “Indians,” sailors and bucaneers, tax rebels, angry women, crank reformers, “tri-racial isolate” communities. I am always looking for the potential in artforms, thanks A LOT..
they always try and make fun of ufo believers, here another good example of media doing that. Nice article. I rewatched Avatar and the points you made were very evident. We all loved the totally sci-fi fantasy of blockbusters such as the Star Wars series and also more recently the Lord of the Rings trilogy. We sat amazed at captivated as we where given a window into new worlds, occupied by fantastic creatures and civilizations. Rightly so both as of the above titles where pioneers in the use of CGI and special effects, creating a new genre of movie epics. You certainly did your research in finding all the possible comparisons to Avatar. That was an amazing article. This should be published in a mag somewhere for sure. Honesty speaking, I never thought Avatar had that much depth in it. I watched it in a rather light hearted spirit. Now, that I have read the article, I need to watch the movie once more. Thanks for the information. Hopefully I would be able to understand the deeper issues this time. what a brilliant article. The film is a mix of all human emotion.It shows we are all oneness having the chance to experience reality. So I think it’s quite inspiring movie to see and it’s great, more power to him and I see he’s wanting to plant 1million trees which is great! A simple idea like – tree – transformed into a great record busting movie, only Cameron could had done it! “The longstanding American tradition of pantheist nature spirituality” is something I’ve yet to stumble across, unfortunately. I seem to find a lot more of “the longstanding American tradition of monotheist power worship.” Ay, well . . . Being a techie I always go through many of the blogs but in a very rare case the blogs have the ability to stick its potential visitor for a long span.But here I want to tell that u have done a awesome piece of writing with the background theme soothing for the posts. Keep up ur good work. did you catch this: http://ecologywithoutnature.blogspot.com/2012/08/of-planet-sense-sydney-talk-mp3.html ? I think you may be being a little hard on AVATAR. If we take the opposition that Ted Friedman makes between the cyborg as the figuration of a science-fictional techno-reality and and the centaur as the figuration of an imaginal reality, then I don’t see the techno-reality as hegemonic. Hollywood put itself at the service of a desire for fantastic world-making that contains both literal and imaginal perceptions and modes of existence. Obviously both STALKER and SOLARIS go farther in this direction, but they end up by expressing an excessively dualistic vision. In SOLARIS the disability is present in the form of the protagonist being, or having been, an emotional cripple. Though it is laughable on a literal or even symbolic level that the cripple Jake Sully should save the majestic Na’vi, the imaginal reality is quite other: it is the “saving power” of the world Pandora that heals Jake and ensouls his body, after subjecting him to copious laughter. He is incorporated into the eco-system of the planet, the story is that of a cripple that cannot be saved by our scientific and technological paradigms. To be saved he must pass from ego to eco.